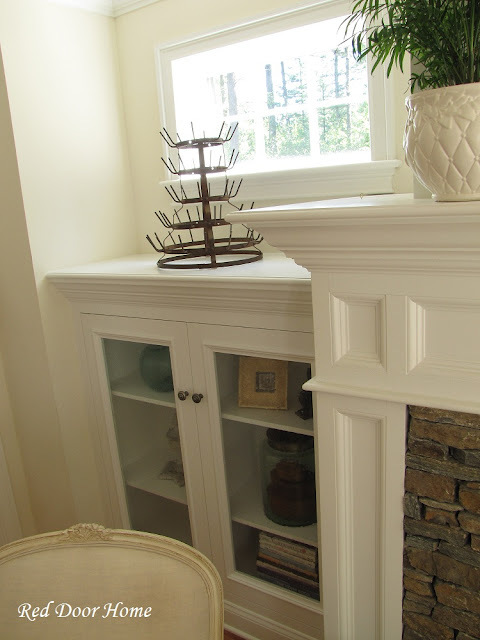 I promised a while back I would share the details of the new built-in cabinets next to our family room fireplace. They were eleven years in the making and definitely worth the wait! Here is a reminder of what the room looked like before. We did a lot of research before we began – looking through magazines, etc. – to find just the right design. The main goal was to match the existing woodwork and details of our house and the previously built media cabinet. The project all came together when we found the picture below. Once we had the inspiration photo and worked out a few details, our carpenter went to work. It took several weeks from the time we had finished design plans to the installation. Even though a good portion of the work was done off-site, putting the cabinets in place still took the better part of two weekends to complete. 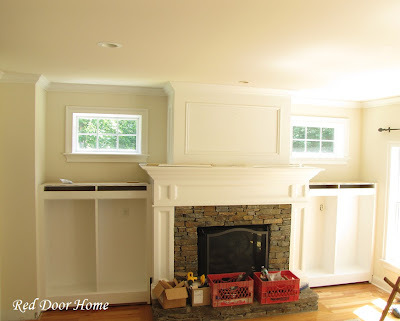 The first phase involved removing molding, pulling out electrical outlets and building boxes on to which the finished cabinets would be attached. Things went well until it came time to install the right side cabinet. 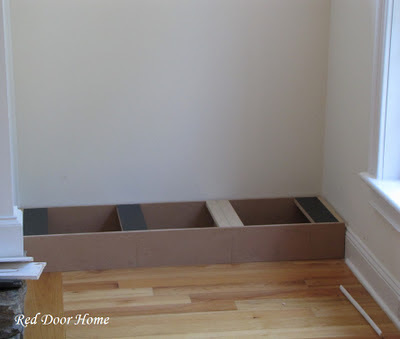 Because of the window ledge, there was not enough space to angle the cabinet into place. What to do? 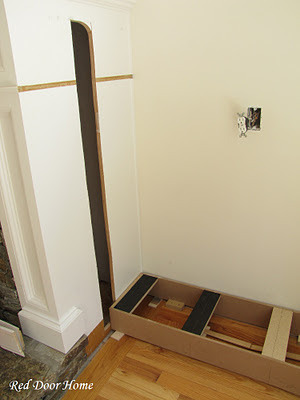 The solution was to cut a hole in the side of the fireplace which would be covered up by the finished cabinet. 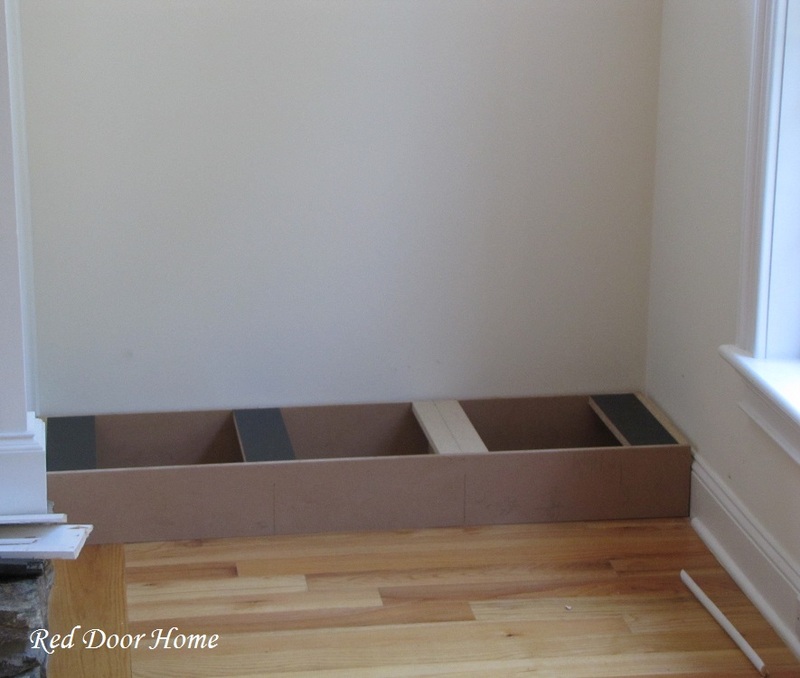 The cut out gave the carpenter just enough space to maneuver the cabinet into place. After day one, the cabinets were already taking shape. The second day involved adding the details which make the cabinets beautiful. The picture below shows the addition of the top molding and the following picture shows the cabinets with the bottom molding. 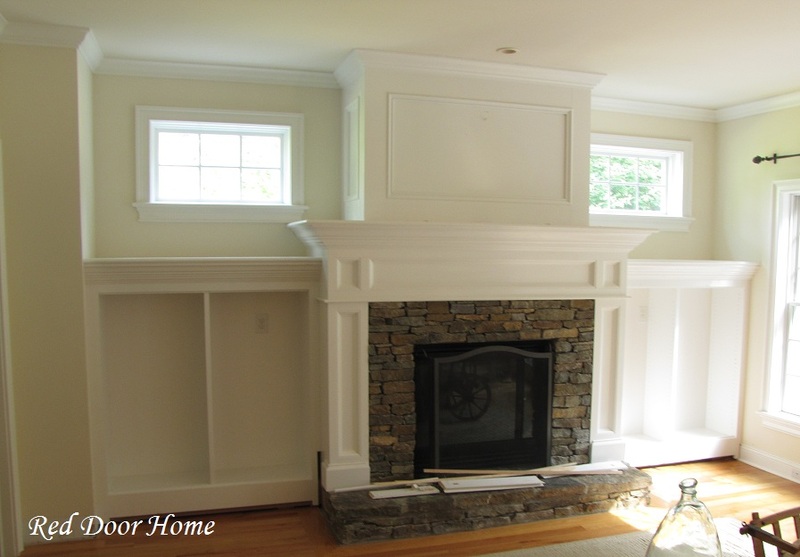 We paid special attention to match the profile of the fireplace mantel, just on a smaller scale. All of the pieces were painted offsite and then touched up once they were in place. You can see all the nails holes which were filled and later painted. Next on the list were painting, doors and shelves. In the end we decided to use seeded glass. We have the same glass in our kitchen cabinets and I love how the tiny air bubbles mute the contents just enough to make them “seeable” but not the main focus of the room. Of course one of the best parts of the project was arranging the shelves. Most of the items are things I already owned – a few are new. 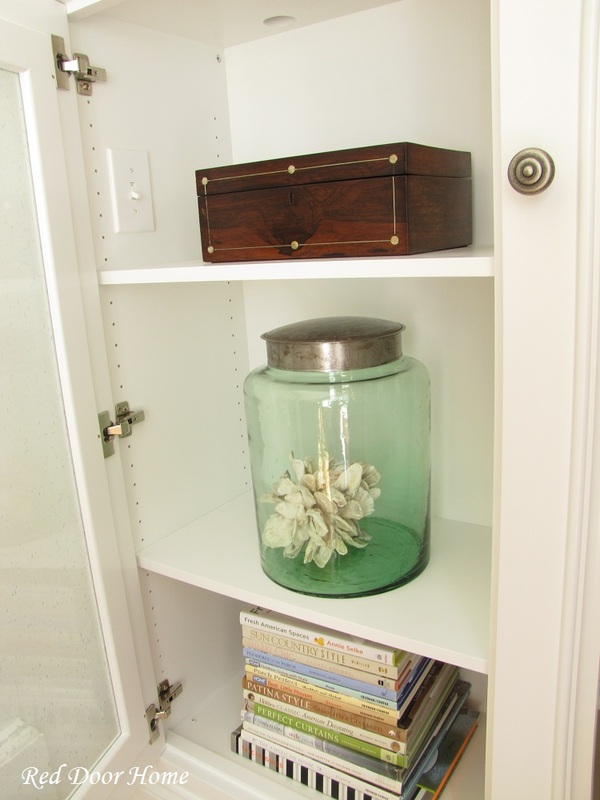 The right cabinets contain the antique English wooden box I won a while back on a giveaway, as well as books and two large glass jars. 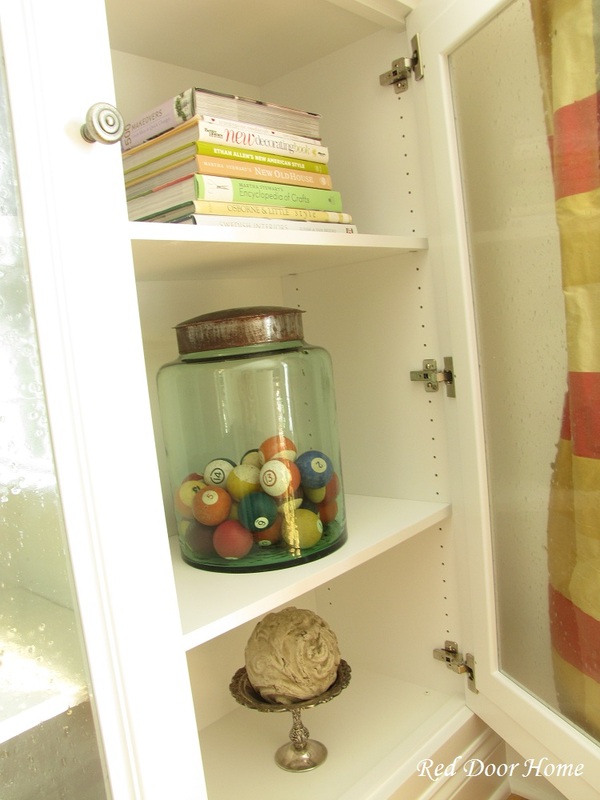 The glass jars are antiques and hold the oyster shell ball I crafted earlier this month and a mismatched grouping of old billiard balls. On top of the cabinet is one of my all-time favorite purchases - a large column top. Long time followers might recognize this piece as its former home was on my dining room table. The left cabinets house a wire basket from Pottery Barn, more books, and a vintage camera I picked up at a yard sale many years ago. 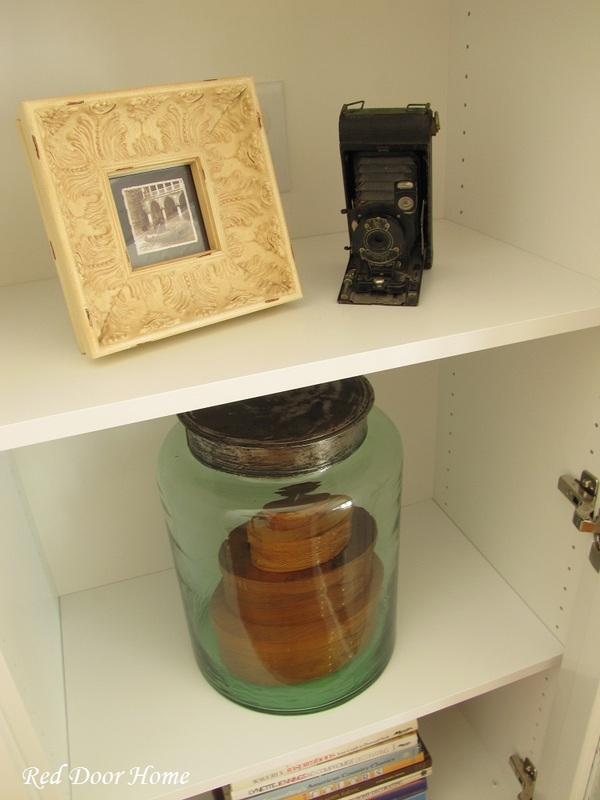 The glass jar on this side holds a set of shaker boxes made by artist Steve Strouse of Pennsylvania. The boxes are graduated sizes and are made from varying types of wood. One of the unique aspects of these boxes is that each one comes with a card telling where the wood used to make the box was found. The left cabinets also feature an old green fishing float and an architectural element found at a local shop which is sadly no longer in business. The top is finished off with an antique French bottle return I purchased this summer during vacation. I have to admit when I bought this I really had no idea where I would put it. Luckily it is very close in size and scale to the column so it all worked out for the best. I can’t thank you all enough for all the wonderful comments you have left about my living room and the new built-in cabinets. 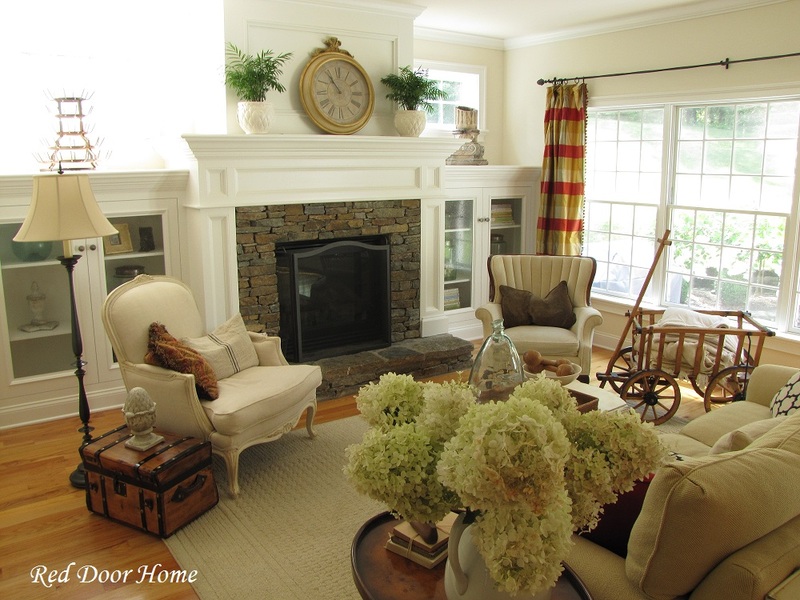 We are thrilled with how this room finally came together and are proud to call it finished! Beautiful! They finish off the room, not to mention all the storage ! Very beautiful and functional. I've always admired built ins and the seeded glass is my favorite. I use it whenever I can. 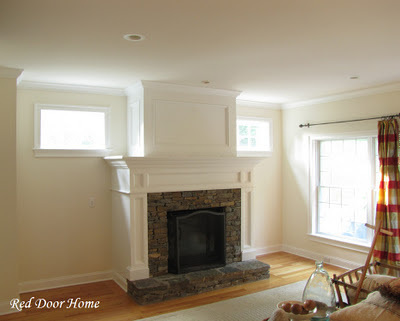 Thanks for sharing the trick of cutting out the fireplace. I just love those built-ins! Your carpenter did a wonderful job and they really look like they've always been there because they look so natural. They are so lovely and the glass doors you picked out are great. Stacy, these were a great addition to the room! LOVE the seeded glass. Thanks so much for sharing! 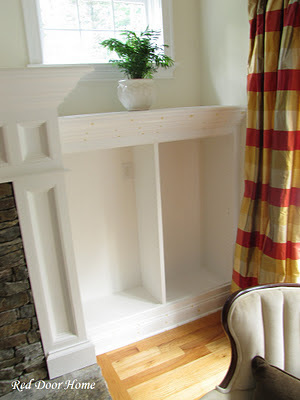 I really love those built-ins and I really appreciate your step-by-step as to how they came to be. I may be inspired to do something like this with a "problem" wall in our dining room that I've been stuck on what to do. Some built-ins might be the answer. Enjoy these - they are beautiful! That inspiration picture was just perfect for your project, Stacy! They turned out beautifully and you've decorated them so nicely, too. I love how they look like they've always been there. Just goes to show that paying attention to those little details can really pay off. Your room really speaks to me.. I love it and all your accessories! I really love your built ins and your entire room. I'm so glad that when we built our new home that we added them too. It's wonderful Stacy and the styling is perfection. Your room makes me swoon! (Oh, isn't that rhyme silly...) But really, the room is truly lovely! Hi there, I'm sure you have another project "waiting in the wings" but this one is perfect! 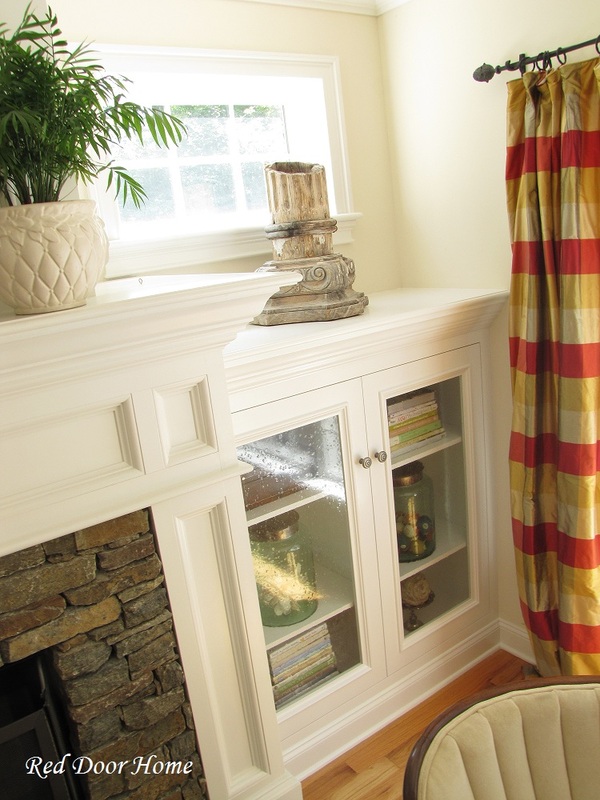 I love the architectural detail built-ins add to a space..not only are they functional but also aesthetically pleasing. And now you can enjoy all your wonderful eclectic treasures. Beautiful, Stacy! Looks like they've been there forever. Such character! 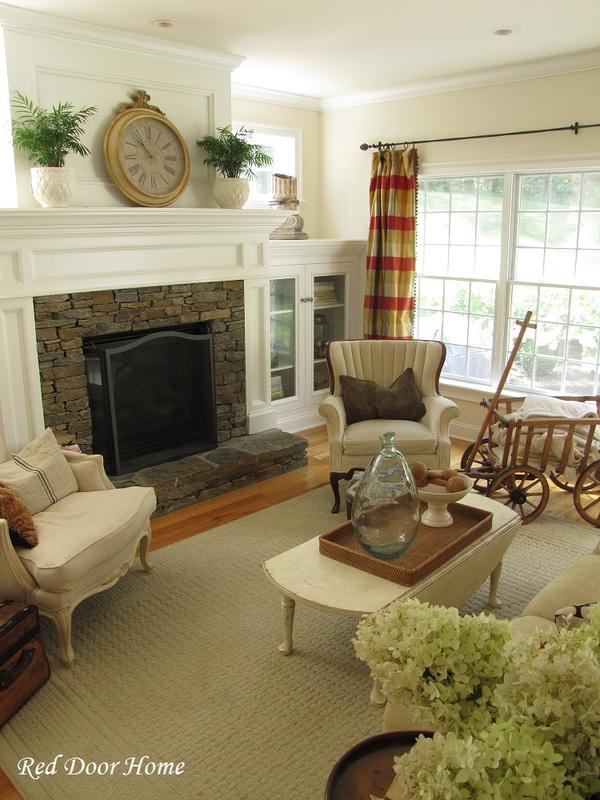 Your new cabinets on either side of the fireplace are just perfect and look as if they have always occupied that space! I know that you all will enjoy them and love displaying favorite items. I have a German wagon like yours that my dad sent to me from Germany 66 years ago. Now I want to use it in my family room. they are PERFECT! y'all did an amazing job. they look just like the fireplace and shelves of an antique house I have seen for sale in our area. 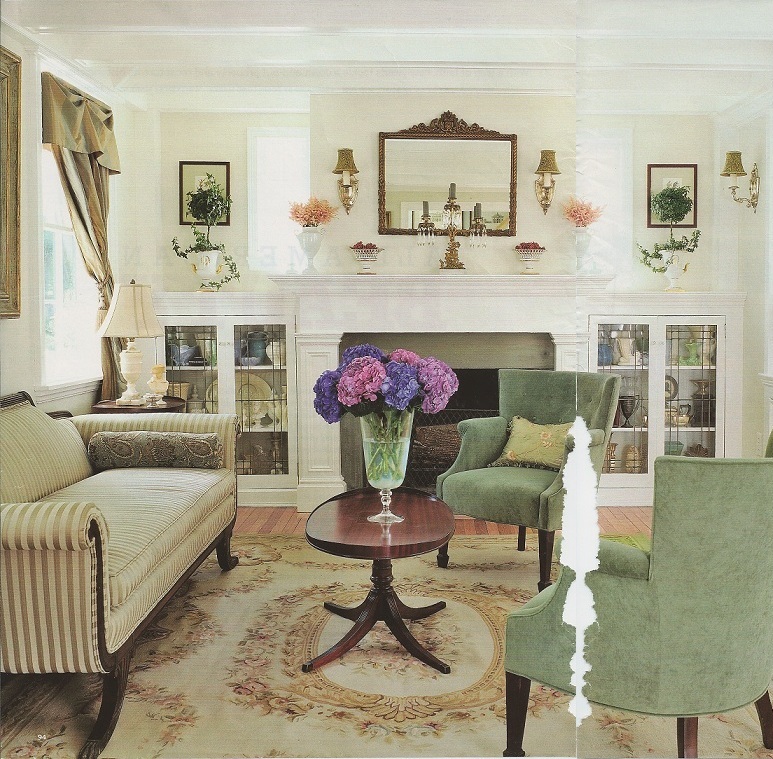 And, that's the best compliment- when it looks like it is original to the house. Great job! Your last photo shows off your living room the best, I think. Those cabinet are just super and so polished. I did my kitchen and now I want to do the rest f the house as it looks so nice. Your room is beautiful! The built in book shelves add so much to a home -you have them decorated so nicely. Those built-ins are beautiful! Thanks for the details! What a lovely room! Visiting from The Inspired Room. Oh so pretty! I love, love, love them! I would love to do something along those lines for our fireplace downstairs. It's a 1950's home with some, um, interesting choices. Thanks for the inspiration! What a wonderful change this is to your room! Beautiful blog and I'm following now! 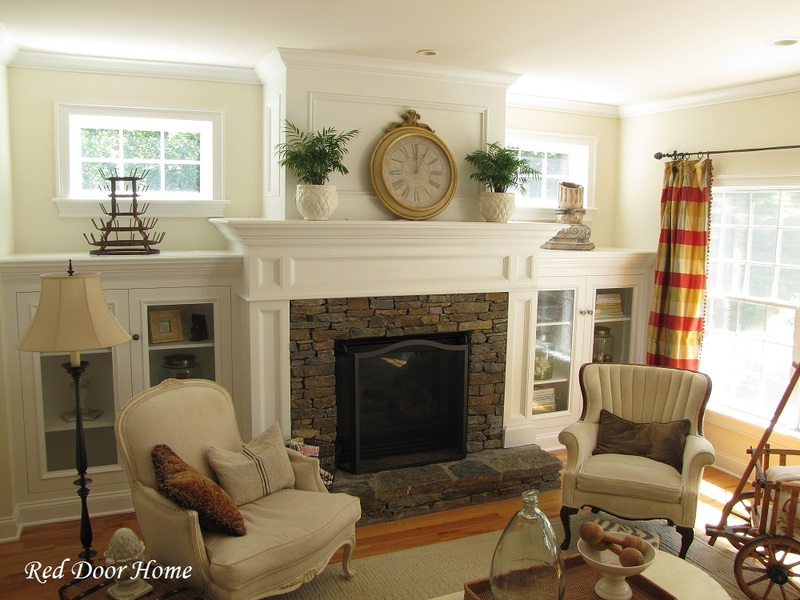 I love the stone on your fireplace surround. Do you happen to know what it is (manufacturer, etc.)? I would love to put this our fireplace that is under construction. Yes I love the stone also! Can you share the name of the manufacturer?